Using our websites innovative home search tool will provide you with all the newest information regarding Allen homes for sale. More than 81,000 people reside in the suburban community of Allen, Texas, one of the fastest growing communities just north of Dallas. Allen was founded by a purchasing agent of the Houston and Texas Central Railway in 1870. The town’s early growth was due in large part to the arrival of the railroad and was later enhanced by the expansion of nearby communities. Located in southwestern Collin County, Allen was most recently nominated by Money Magazine as one of the "Best Places To Live" in the US. The city has its own Allen Event Center and its own minor league hockey team. The city is adjacent to I-75, one of the state’s major interstates that link residents to Dallas and Houston. Students are served by 16 elementary schools, three middle schools, one freshman center and one high school within the Allen Independent School District (AllenISD), one of the state’s most desirable districts. In 2010 Allen ISD received an Exemplary Rating from the Texas Education Agency. For post-secondary education, students can attend nearby Collin County Community College. Texas Christian University (TCU), Southern Methodist University (SMU), University of Texas at Arlington (UTA), University of Dallas (UD), University of North Texas (UNT) and University of Texas at Dallas (UTD) are excellent post-secondary selections in the Dallas-Fort Worth Metroplex. Allen's Parks and Recreation Department maintains sport complexes, parks like the much noted Celebration Park, the Allen Senior Recreation Center, Don Rodenbaugh Natatorium, Ford Pool and Joe Farmer Recreation Center. Residents enjoy fishing at nearby Lake Lavon. 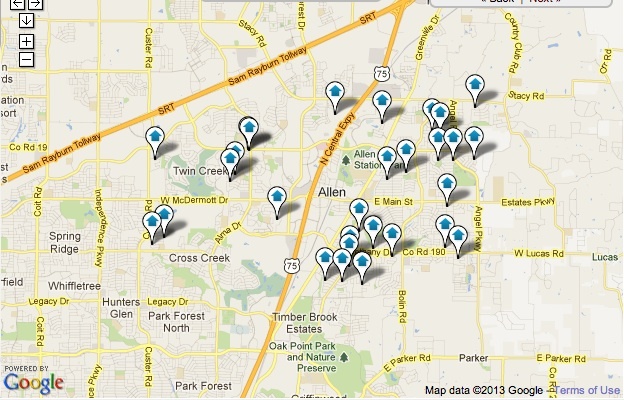 Allen real estate offerings consist primarily of single-family homes and townhomes for sale. Allen’s convenient location, numerous recreational possibilities and lovely homes continue to draw new residents of all ages. Contact an experienced Allen REALTOR at The Todd Tramonte Home Selling Team can assist you in your Allen home search. Looking to Relocate/Move to Allen, TX? Listing courtesy of North Point Realty.